Transition to La Nina Underway. SST Anomalies Continue to Decline. GWO Spirals Into La Nina Territory. Equatorial Pacific SSTs have continued to cool and TAO/TRITON data shows -1.0°C or greater anomalies extending from 95°W to beyond 150°W. According to the CPC's Weekly ENSO Update, issued June 21, the latest weekly SST departures were -0.7°C (Niño1+2), -0.6°C (Niño 3), -0.5°C (Niño 3.4), and 0.0°C (Niño 4). 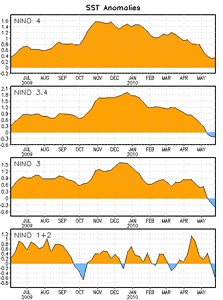 An anomaly of -0.5°C in the Niño 3.4 region is the threshold for La Nina conditions. The Global Wind Oscillation (GWO) has spiraled well into La Niña territory. The global relative atmospheric angular momentum anomaly is at its lowest value since March 2008, during the La Niña of 2007-2008. 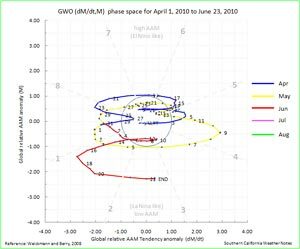 Based on equatorial Pacific SSTs, section plots, tradewinds and cloudiness; and the GWO and AAM; a transition to La Nina conditions appears to be underway. It looks like Downtown Los Angeles (USC) will likely end the July 1 - June 30 water year having recorded 16.36 inches of rain. This is more than an inch above the 1971-2000 annual climate norm of 15.14 inches. SST Anomalies Continue to Decline. Southern California Temps Climb. Woodland Hills (Pierce College) topped the 90° mark for the first time this year Memorial Day weekend, and after cooling a few degrees during the week, temperatures are back into the 90's this afternoon. A quick look at temps around the area shows temps near 70 on the coast; 80's to 90's in the valleys, and triple digits in the deserts. Reflecting the transition to ENSO neutral conditions, the Multivariate ENSO Index (MEI) for April-May declined to 0.54. According to the CPC's Weekly ENSO Update, issued June 1, the latest weekly SST departures are -0.6°C (Niño1+2), -0.4°C (Niño 3), -0.2°C (Niño 3.4), and 0.4°C (Niño 4). In his May 2010 MEI discussion Klaus Wolter projected the probability of a La Nina event emerging by the end of 2010 at roughly 50%. In it's May 2010 ENSO Quick Look, the International Research Institute for Climate and Society (IRI) put the probability of La Nina conditions from the August-October season through the remainder of 2010 at 42%. We'll see! Downtown Los Angeles (USC) has recorded 16.36 inches of rain since the water year began July 1. This is more than an inch above the 1971-2000 annual climate norm of 15.14 inches. The water year ends June 30. Climatology and current forecasts suggest it is unlikely that this total will change by more than a hundredth or two before the end of the month.